Harvest Time Fashion! | Faddegon's Nursery, Inc.
Sep 18, 2017 | Uncategorized, What's New? Autumn has fallen upon us and we couldn’t be more ready for the change of seasons! 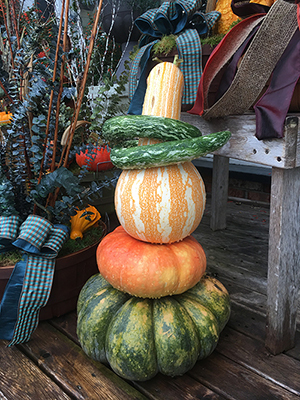 Stop by and take a look at our amazing collection of pumpkins and gourds, huge mums in many colors, pumpkins planted up with succulents, and beautiful one-of-a-kind fall baskets all decorated and ready to go home with you! Set the fall table in style. We have smaller pumpkins and gourds along with place setting sized vases adorned with preserved hydrangeas and fall decor. Don’t leave without a pumpkin stack! !